For a second weekend in a row, Birch and I stayed at Loft Mountain Campground so that we could hike the AT in Shenandoah. This weekend was much cooler. For me, that makes a BIG difference. Cooler weather cuts down my fatigue as well as my need for fluiids. After dropping one car off at the turn off for the Ranger Station (Simmons Gap) we pulled over to the side of the road with the other car just south of the Swift Run Gap park entrance. The first part of the hike is straight up, about 800ft in about 1 1/2 miles. Since its the beginning of the hike, I felt pretty fresh and it was very manageable. As you can see from the photo below, the view was well worth it. This is High Top Mountain. It isn’t as crowded as some of the more popular areas of the park, and this makes it a nice destination in itself. After admiring the view, down we went! The trail descends about three miles, passing the Smith Roach Gap Fire Road. 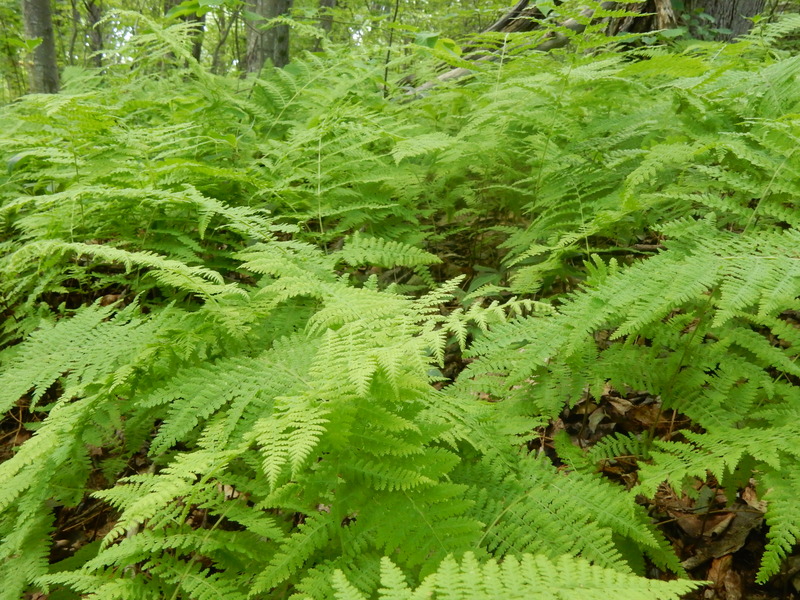 I couldn’t help take some photos of the ferns near here. So beautiful! After crossing the parkway at Powell Gap we ascended less than a mile before we got to a beautiful overlook. 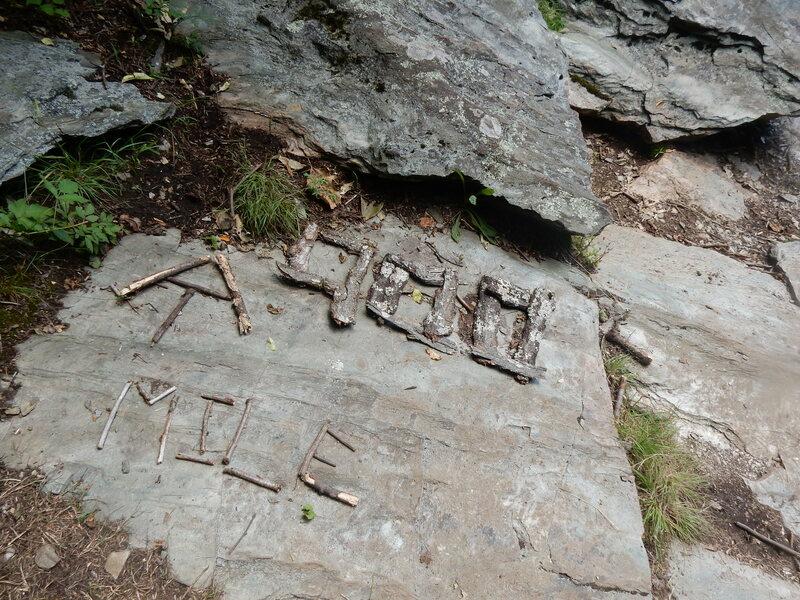 There was a sign there (made of sticks) marking this as the 900 mile mark of the AT (from the south, of course.) Tod and I used this as an opportunity to take a nice long break. After eating our sandwiches we put on our fleece jackets and made coffee. It is times like this on the trail that make all the hard work worth it. We really enjoyed the opportunity to relax and enjoy our surroundings. We could see the parkway way below us, houses in a town far away, and an incredible blanket of trees that seemed to go on forever. Coffee + hiking + view = bliss! It was a quick hike back to the car, which was less than two miles away. When we exited the trail we realized that there was a small parking lot across the road from the Ranger Station entrance that we could have used. This is good info for next time, when we continue our southward adventures. 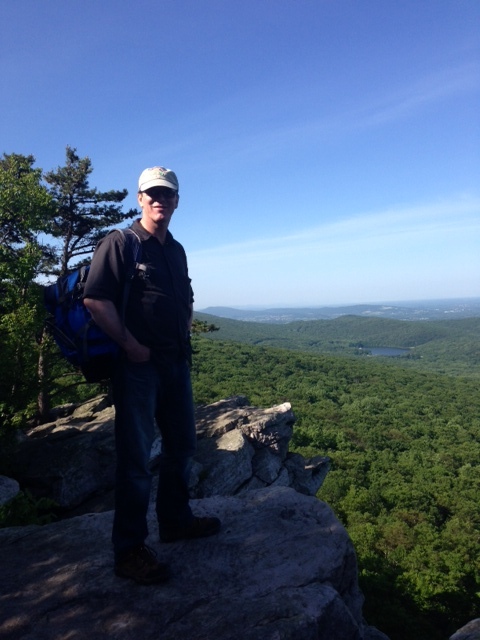 A beautiful day and an eight mile hike is a great combination for a June day. 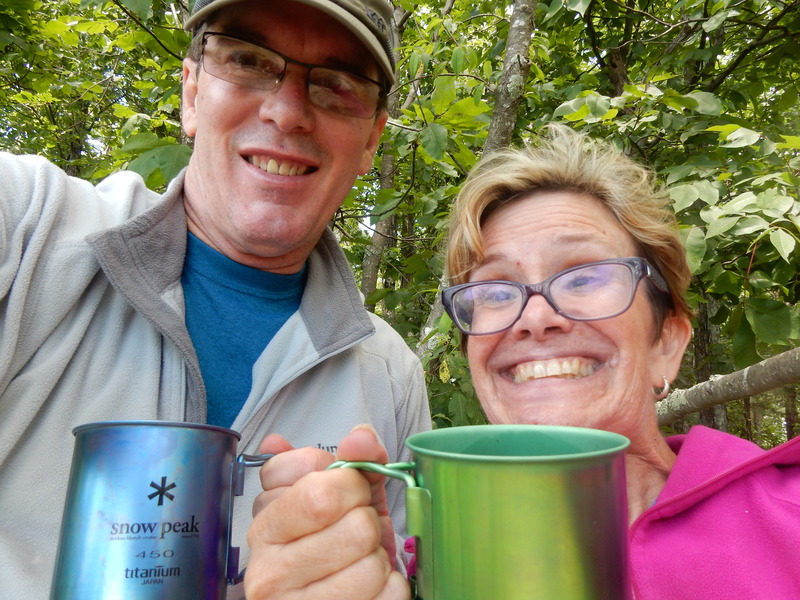 We began our hike at Lewis Mountain Campground. 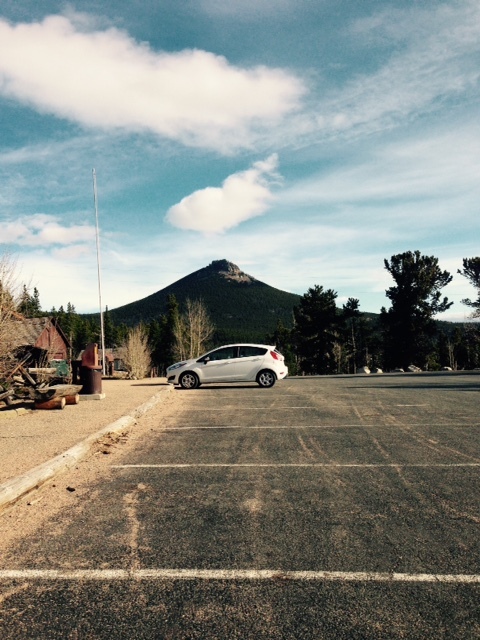 There is limited parking by the camp store but there is plenty of parking near the picnic area. 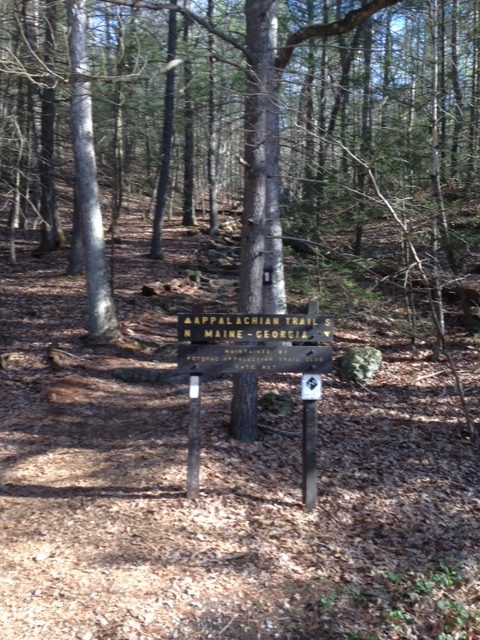 The AT is a gentle, downhill trail for about a mile before leveling off. The easy trail is a nice break before the gentle slope UP that brought us to the top of Bald Face Mountain. There really aren’t any switchbacks (it isn’t steep enough for that) but there were several spots where they had these really cool set of stairs. (It feels a bit magical to ascend up stone steps in the middle of a forest!) I was hoping that there would be a great view but no such luck. There is a nice slab of rock and boulders at the peak. It is a perfect place to stop for lunch but the foliage prevents one from seeing the countryside. Birch and I pressed on until we reached the bottom of the mountain near the South River Falls Trail. We knew there was a picnic area about a mile away but we decided to have lunch here. I’m glad we did. This spot has a number of nice boulders for sitting. The picnic area turned out to be about 1/10 of a mile off the trail. 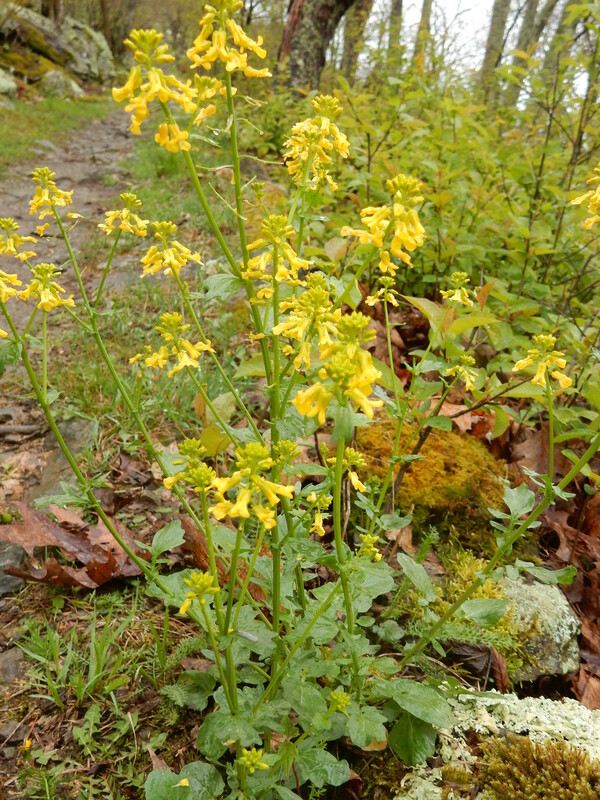 Along the way, there is a variety of vegetation. 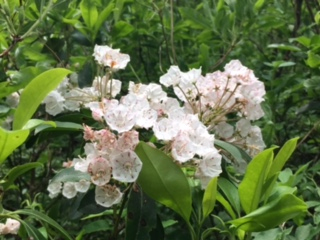 My favorite is always the mountain laurel. However, there were giant (I mean GIANT!) ferns that I liked as well. The last part of the hike was about 1 1/2 miles up (perhaps 500 ft change in elevation) and 1 1/2 miles down. Along the way we met a really nice family from New Zealand, taking a 5 month vacation on the trail. Their son was probably 5 or 6 years old. He was having a great time. After all, he had just seen a snake! I’m always amazed at how the AT brings so many people from different walks of life together. We reached our other car, parked at Swift Run Gap, in no time. Afterwards, we visited the Loft Mountain visiting area for some blackberry ice cream. Hiking + ice cream! Perfect! Shenandoah is known for Blackberries. 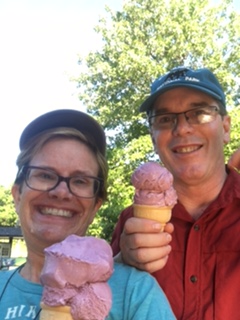 Blackberry ice cream? Yum! Now that it is early May, the foliage in Shenandoah National Park is finally starting to awaken. Birch and I were excited to get back on the trail. 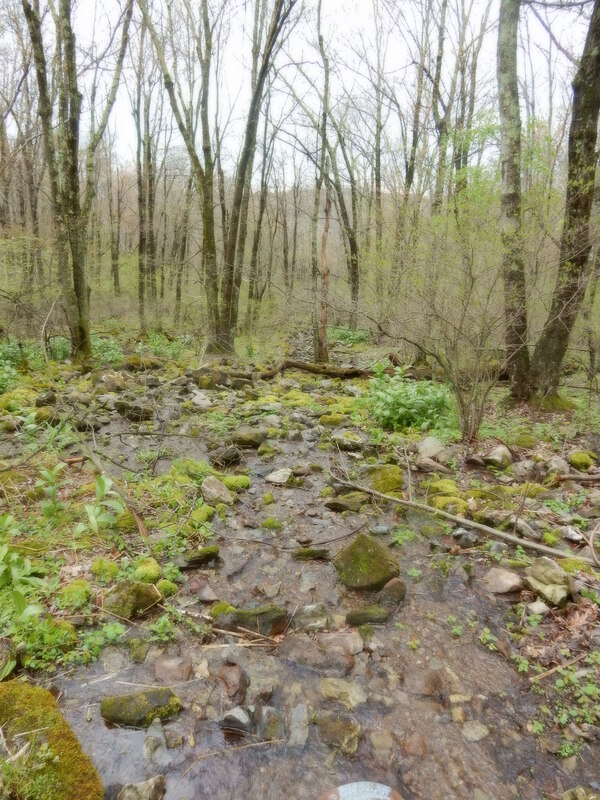 It has been ages since we’ve hiked in green foliage. The weather in the area has been wet and cold. When we arrived at Fishers Gap it was foggy and raining. Not exactly the type of weather one would choose for a 10 mile hike. Still, we donned our rain gear and started off. The birds sang to their heart’s content, clearly unfazed by a little dampness. This, and the stunning green all around me, lifted my spirits so that I hardly noticed the weather. The first part of the hike is a pretty gentle uphill climb. We had fun meandering around Big Meadows Campground and even got to see our tent. (We often stay there while hiking in the park.) 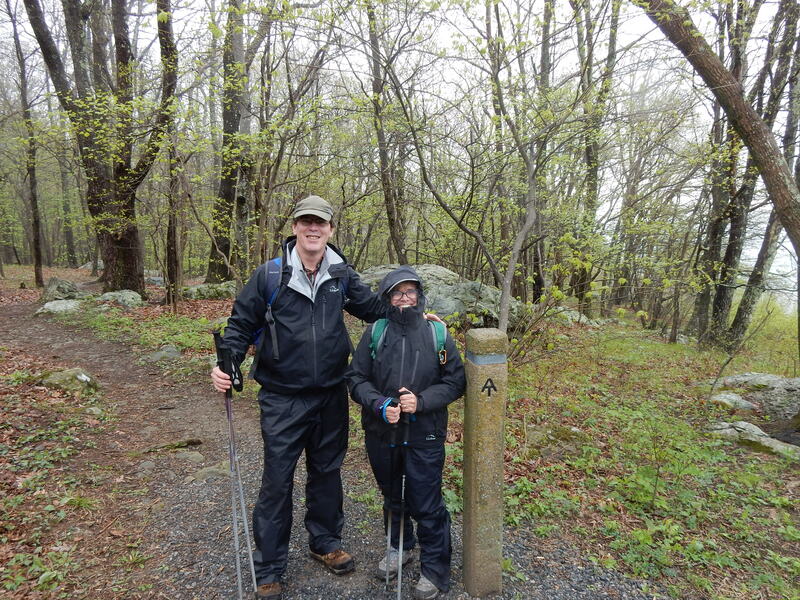 By the time we reached Milam Gap, the rain had stopped. We cross the road continued up to Hazeltop, which is at about 3,800 feet. Despite being at a high spot in the park, I can’t say that this is a hike with a lot of views. There are very few vistas. 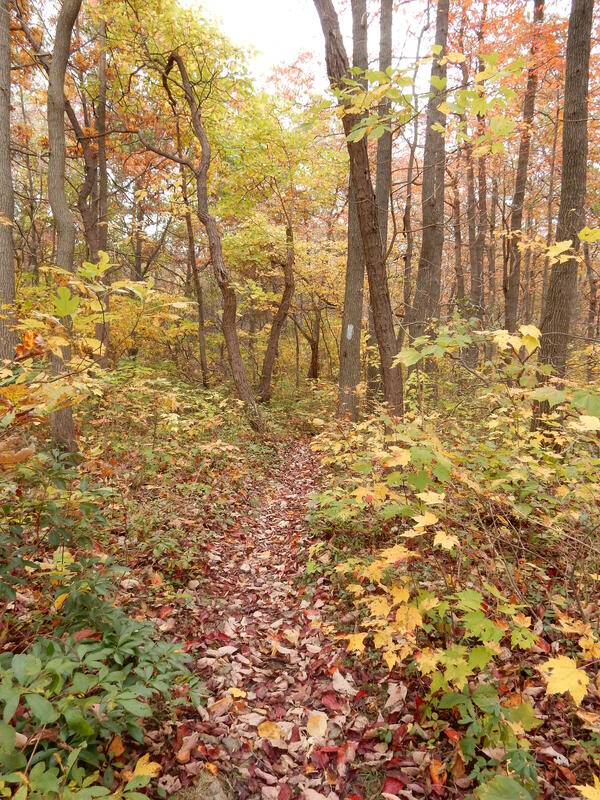 Instead, the real value is of this hike is taking in the beauty of the forest. 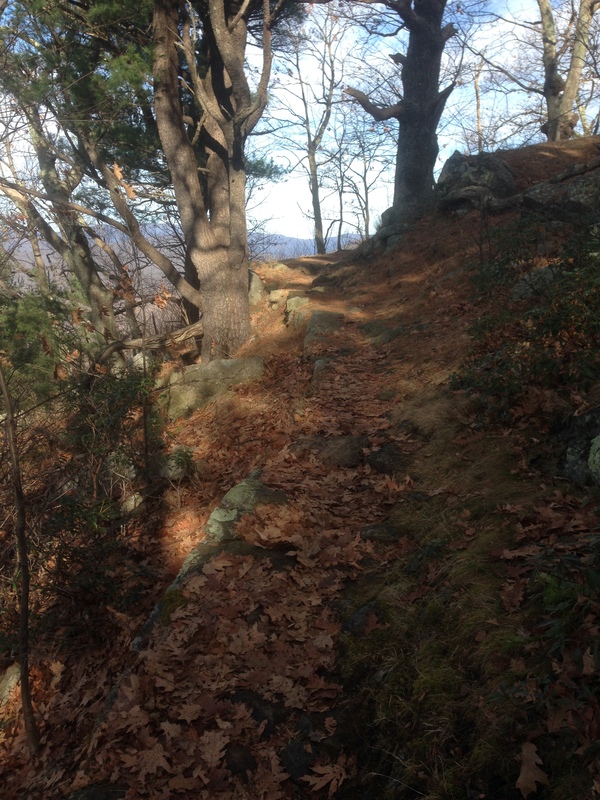 The trail in this section of the AT is remarkably smooth. It wasn’t until we got to Bearfence Mountain that things got rocky. We skipped the option of doing the rock scramble here (we’ve done that before!) and stuck to the AT. There are a series of switchbacks that takes one down the mountain before ascending once again to Lewis Mountain Campground. Despite the weather, we completed this section feeling great. I’m so glad we didn’t let a few raindrops deter us! 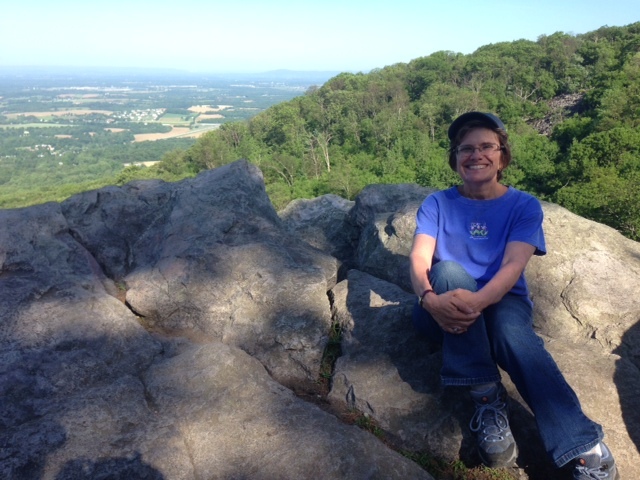 We returned to Shenandoah and resumed our southbound hike at Thornton Gap. The first three miles was all uphill, and after an hour Karen and I were both wishing we had brought quick energy food. “Should we bring some gorp?” she asked me this morning as we rushed to leave the house. “No, we only have 6.4 miles to hike,” I answered hastily, mentally relegating the mountains to obstacles of little consequence. Most of the trail was on a ridge cut into the side of the mountain, which provided us with great views through the leafless trees. We stopped for lunch about a quarter mile north of Bird’s Nest No. 3. We saw a flat and grassy patch of earth with boulders just the right size to sit on, and with an amazing view toward the west of the park, and we couldn’t resist claiming the spot for our lunch break. The peanut butter and jelly sandwich didn’t quite meet my calorie needs, but the cup of hot coffee that followed somehow left me feeling content. By the time that we made it to our destination, the park had become surprisingly active with visitors. We were glad to see that so many had decided to skip the madness of consumerism and, instead, opt for outside experience. 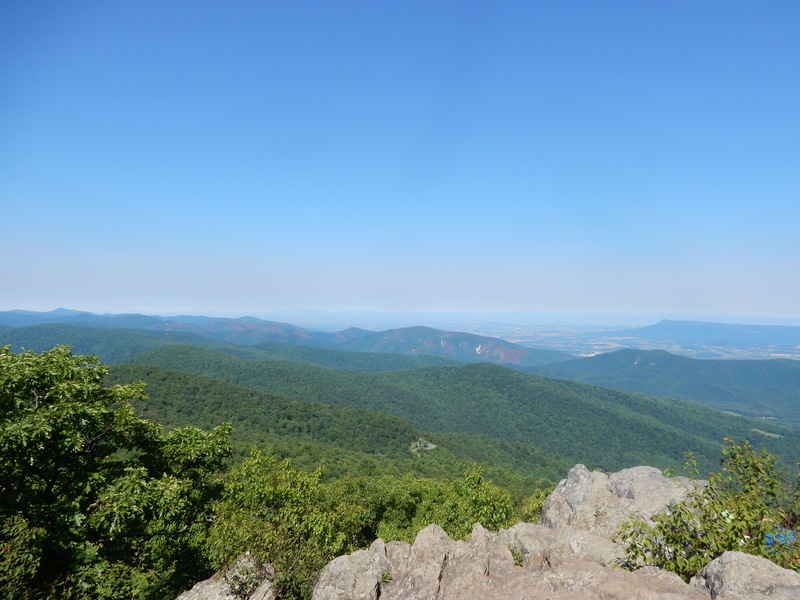 Four weeks ago, Shenandoah National Park was jam packed. Cars were parked on the side of the road, and overlooks were crammed with folks trying to get that perfect selfie with bright tree colors in the background. 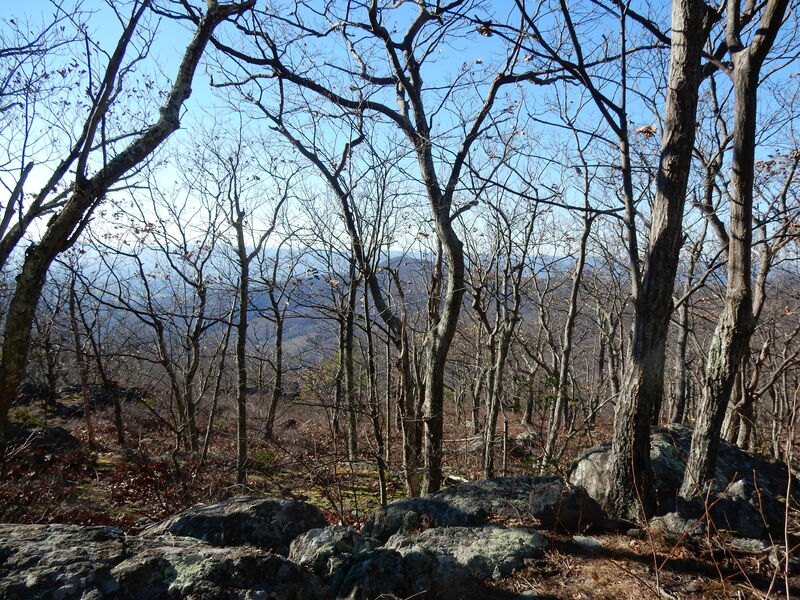 Tod and I arrived to Shenandoah on November 15 to a vastly different park. The leaves on the trees were long gone, and so were the people. 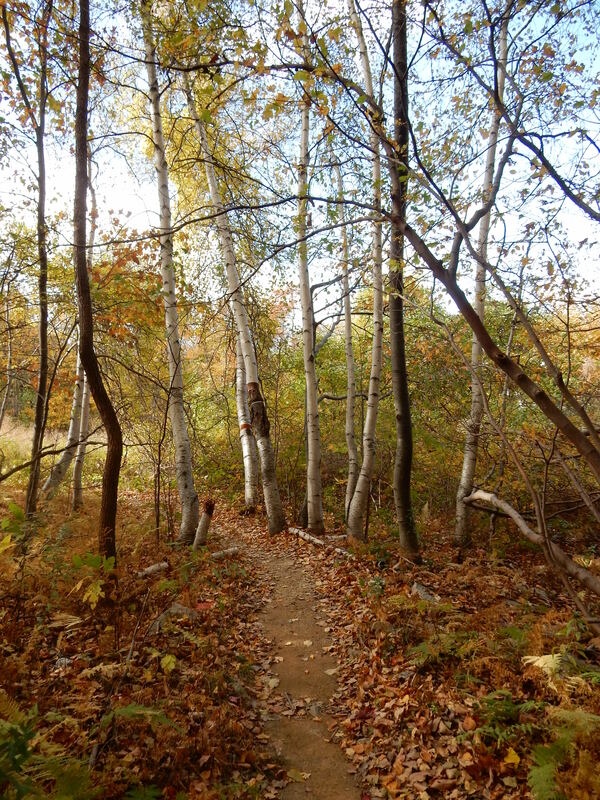 One of the best kept secrets to hiking is that late Fall hikes offer both solitude and beauty. Tod and I took off from Elkwallow Picnic Area (approximately mile 24 on Skyline Drive) and hiked south on the Appalachian Trail. The woods looked completely different than the last time we were here. The lack of leaves afforded us the opportunity to see through the trees to the mountains in the distance. The sound of leaves rustling under our feet gave us confidence that even if a bear was still around, she could hear us from miles away. The hike took us up a hill and then leveled off for a couple of miles. We saw signs for Byrds Nest 4 and thought that it might be a nice place for lunch. Unfortunately, it is .6 miles off the trail. With a perfectly good log nearby, we enjoyed a good meal (including a tangerine) while sitting next to the trail. Eventually, we crossed the road and climbed Pass Mountain. 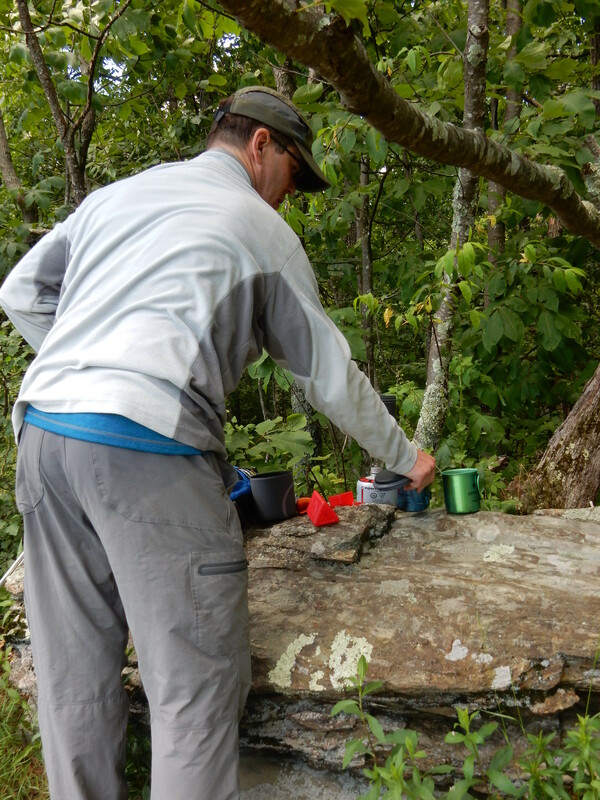 We found a perfect spot for breaking out the camp stove and Tod made us some delicious coffee. (We were careful to choose place with rock and few leaves so that we wouldn’t set the mountain on fire!) It was near here that we ran into two different families hiking with babies. The littlest was 3 months old, making him the youngest hiker I’ve encountered on the trail. As we were finishing our hike and the sun was low in the sky, Tod noticed an amazing thing. 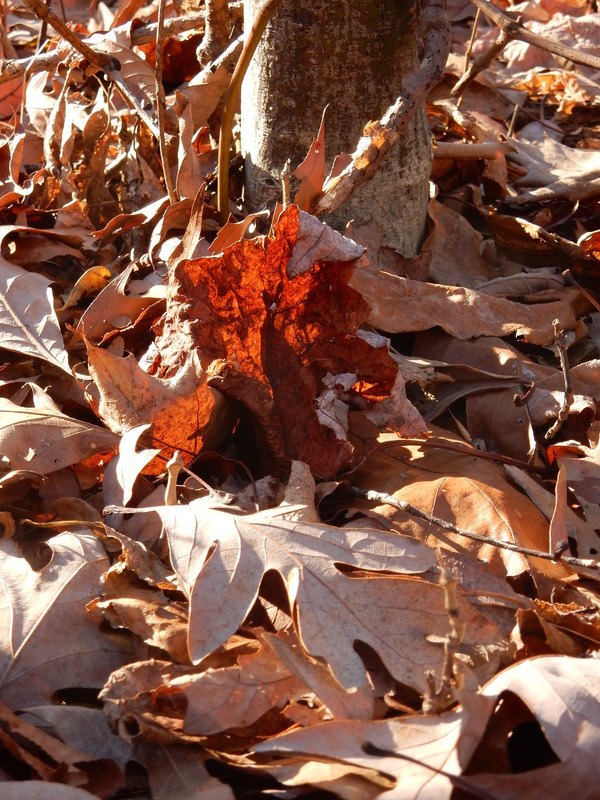 The leaves on the ground seemed to shine a bright red. The ground twinkled with color! It was another great reminder for us about why we love hiking. Being in the woods is truly an special experience. We crossed the road a couple of times before getting to Thornton Gap (near US- 211) where there is a restroom and plenty of parking. In all, we did close to 8 miles. Lots of fun on a Fall afternoon! One motto all backpackers and hikers must have? 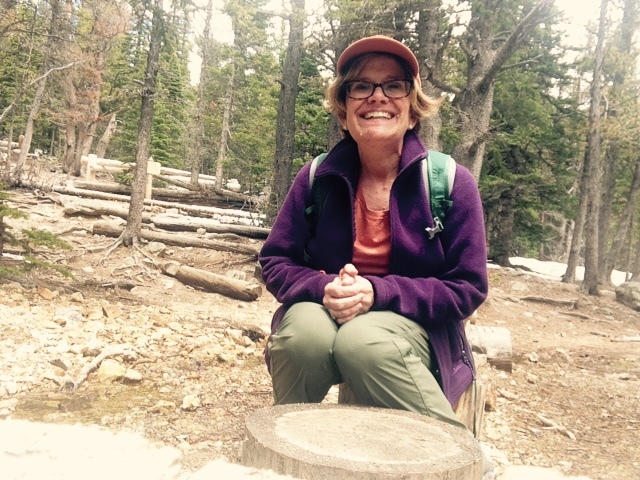 “Never pass up an opportunity to visit a national park!” After attending a professional conference in Denver, I couldn’t resist the chance to hike in the Rockies. There were so many trails to choose from that it took me days to settle on Estes Cone. Why Estes Cone? The Cone is a moderate hike with excellent views and the chance to arrive at a summit. As important, it was accessible (just moderate snow) and trails hadn’t been wiped out by flooding, etc. (as is the case in some areas). This time I was solo. 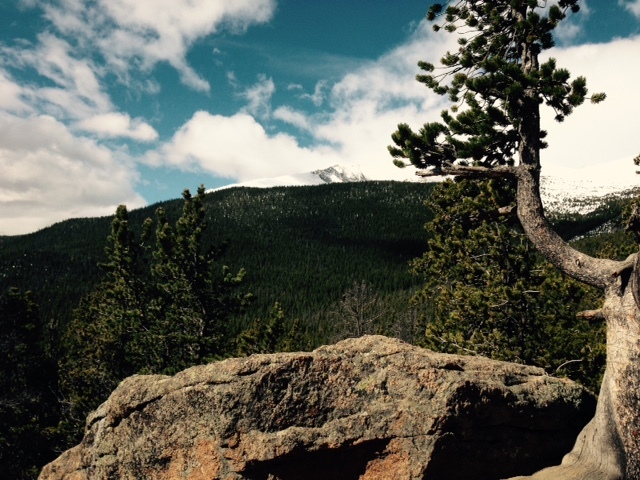 I arrived at the Longs Peak trailhead to start my adventure, only to find that I was completely alone. Not a single car in the lot and no park rangers! The trailhead is not well marked so I had no idea where to begin. (I found a trailhead but wasn’t sure if it was the right one.) Just then, two young women came from out of nowhere carrying coffee mugs. They were on a short morning walk from their camping area. Voila! I was guided to the right spot and started hiking. Estes Cone in the background. The trail begins around 9,400 feet and ascends slowly. 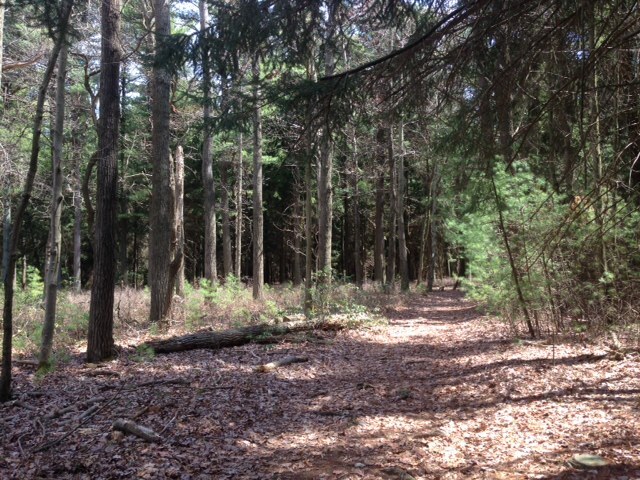 I was among beautiful pines and loved hearing the tweets of nearby birds. The sounds of spring, combined with cool weather and a snowy trail, was an interesting contrast. I ended up putting my crampons on for a short while. Every once in a while I got a view of my ultimate destination. It seemed pretty daunting! 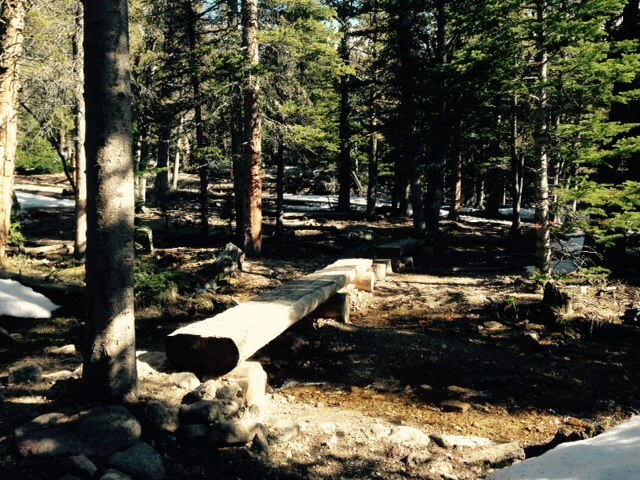 Eventually, the trail comes to a bridge made of a half-log that crosses a beautiful stream. At Eugenia Mine (according to a sign it produced more dreams than gold) the trail turns to the right. After many ups and downs, the trail comes to a field. As I stopped to take a break, another couple passed me. “You must be the person who owns the other car in the lot!” they said. They were seasoned high altitude hikers so they moved faster than me. The trail goes up and down, until it eventually came to the .7 mile steep ascent to the top. Apparently, the Rocky Mountain National Park doesn’t believe in using tree markers to delineate trails. No white or blue blazes to follow! Instead, a series of cairns guided me as a steadily made my way up. In the dense trees, I had no idea how close I was to the top. 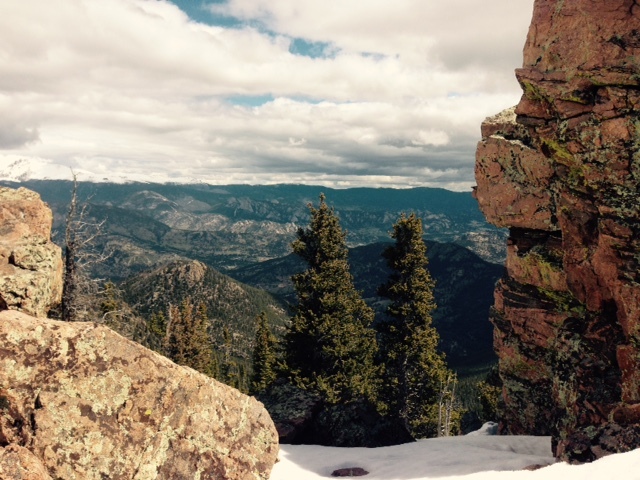 As I got higher, however, the “trail” became more and more rocky, with more and more snow. At the advice of the couple who had passed me and now were on the way down, I put my crampons back on. The summit, at just over 11,000 ft., was completely worth it! Although the weather threatened all day, it was still a spectacular view. Although windy and cold, I enjoyed a delicious sandwich at the top, and much to the dismay of a nearby chipmunk, I ate the whole thing. Descending wasn’t too difficult, but I did need tp pay close attention that I didn’t leave the trail. The ice and snow made walking tricky, so I tried to take my time. At one outlook area, I stopped to eat more snacks. I didn’t want to leave! Instead, I tried to savor my time on the trail. All things must come to an end. 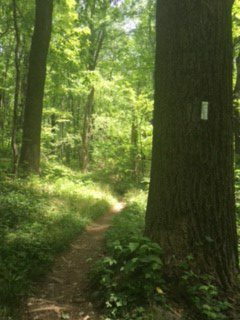 As I left the trail, I met a park ranger who said he is moving to Gaithersburg, Maryland (my hometown) in the next few months. How about that!?! All in all, I can’t wait to come back to the Rockies and try an even more ambitious hike. I’m ready! 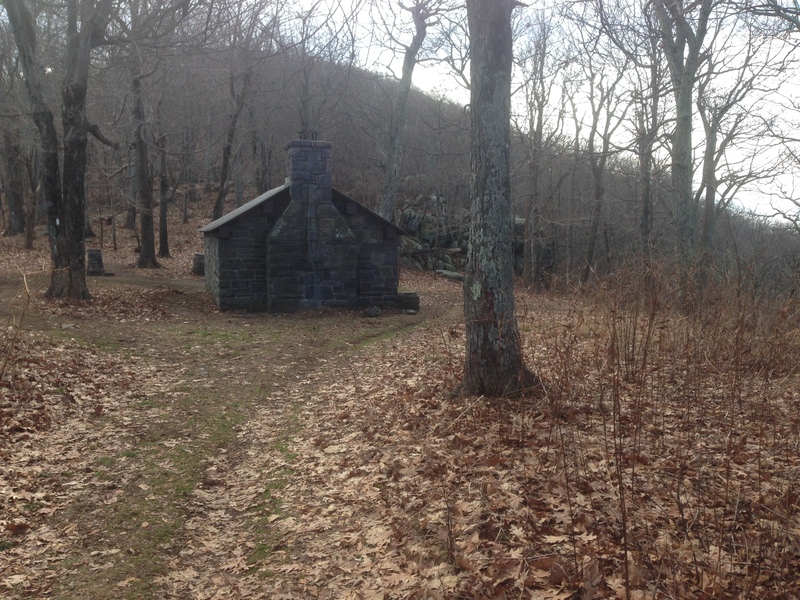 Appalachian Trail: Caledonia State Park to Shippensburg Rd. Finally! 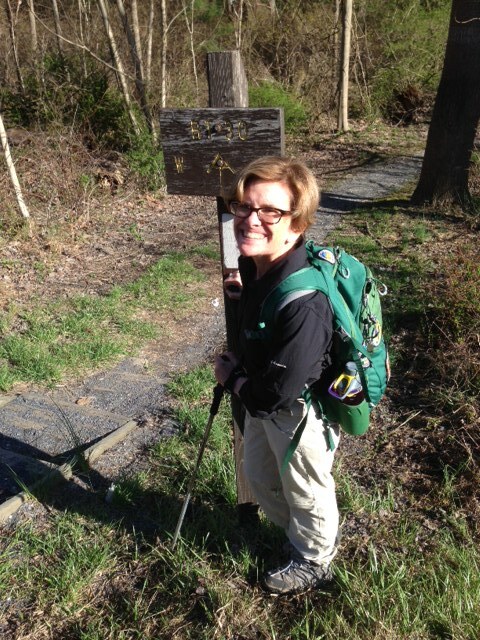 Another hike on the AT! 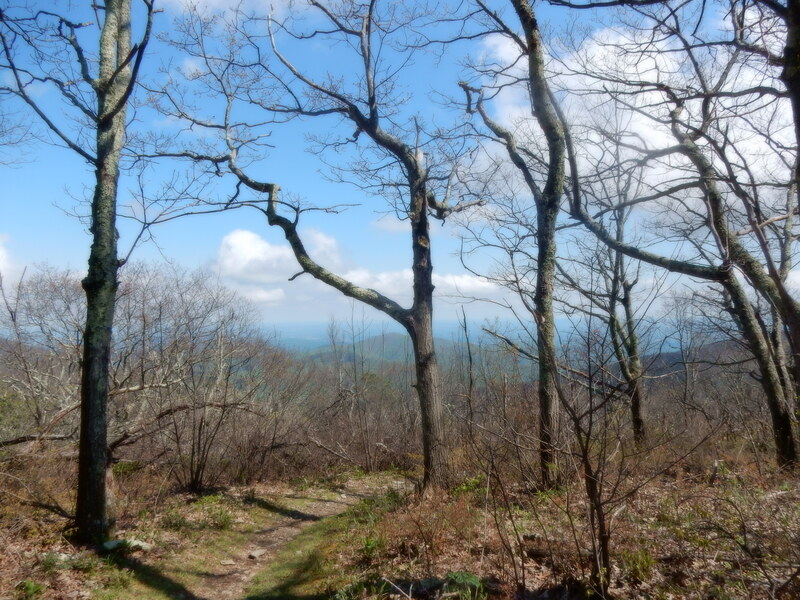 It is amazing how addictive it is to hike along the Appalachian Trail. Now that spring is here, I couldn’t wait to check out the trail. Would I see green leaves? 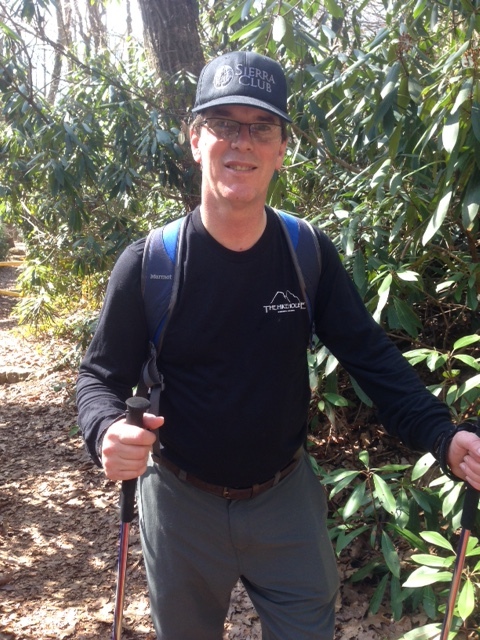 Tod and I have completed the Maryland and West Virginia sections of the trail, so we need to venture further and further out if we want to hike new areas. 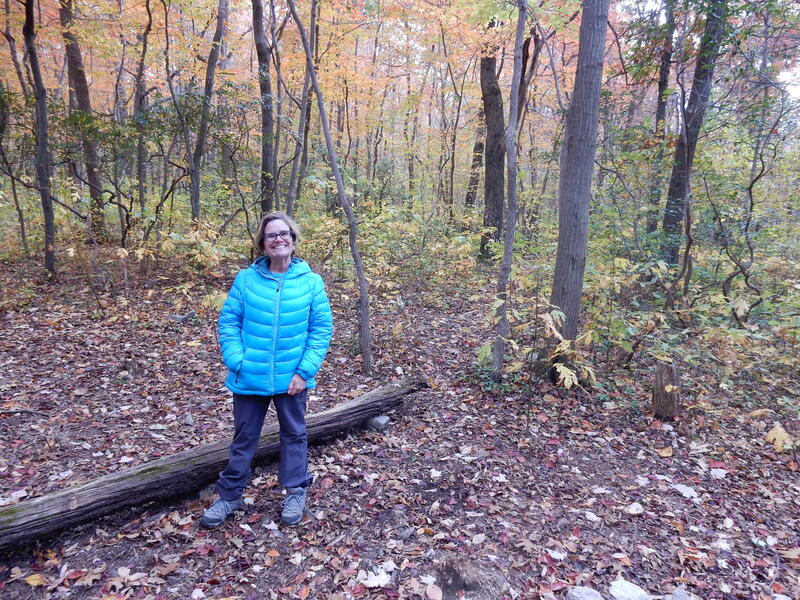 On April 18, we hiked an 11 mile section that begins at Caladonia State Park, Pennsylvania. We parked our car near US 30 and the park’s entrance. After walking a bit on US 30 we were soon on the trail. The first part of the hike is uphill. The trail has a sign on it that says “most difficult”. This was a little unnerving but for those who have been on the Maryland portion, it really isn’t that different than other steep areas. The trees were not yet with leaves but things were definitely greening up a bit. We passed two major shelters on our journey. The first was Quarry Gap. It had amazing tent platforms. They were large, clean and flat, enabling tents to be well off the ground. (I would definitely come back!) 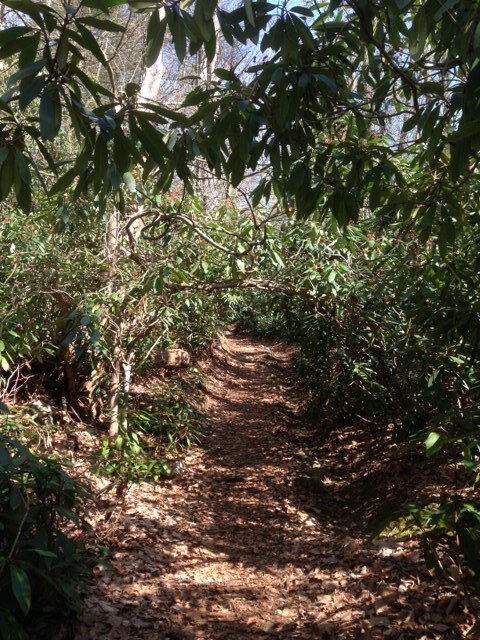 One wonderful thing about the ascent was the beautiful path of rhododendrons along the way. At one point, there was a beautiful arch! Finally, at about the 4-mile mark, things leveled off. We walked along a ridge and had some beautiful views, thanks to the lack of leaves. However, it was a warm day and we really could have used some shade. I really appreciated the diversity in trees and vegetation. It was so nice to finally get to some pines and feel the softness of the needles under our feet, the cool canopy of branches above us. After stopping for lunch, we continued along the trail, crossing roads, power lines, and bypassing a very nice cabin. I was tired and ready to be done. (Tod might tell you I complained but I was really just expressing how impressed I was with the length of the trail.) I was very happy to see Birch Run Shelter, about a mile from our final destination. We stopped to take a break (and admire the beautiful shelter!) before completing our trip, where we left one of our cars at a small parking lot on Shippensburg Road. Tod, hiking along the trail. My motivator and supporter! 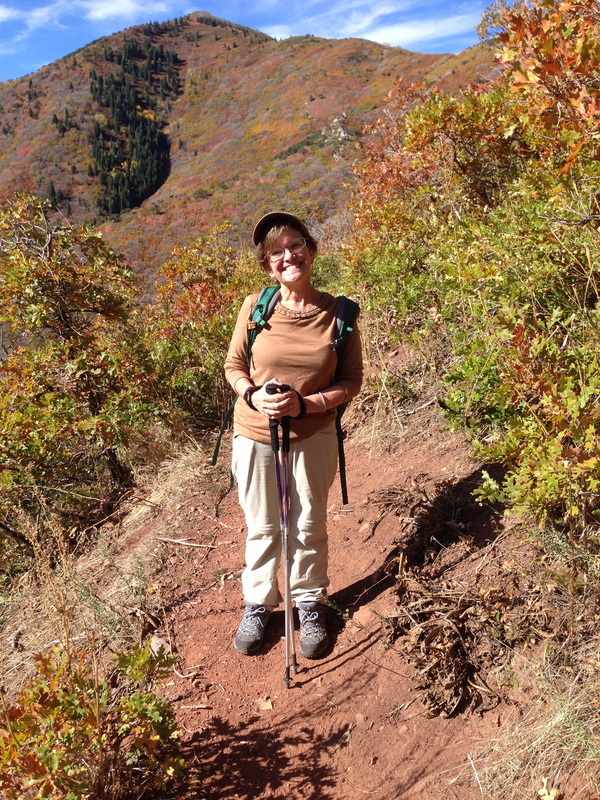 Our trip to Salt Lake City offered us the opportunity to hike some beautiful trails. 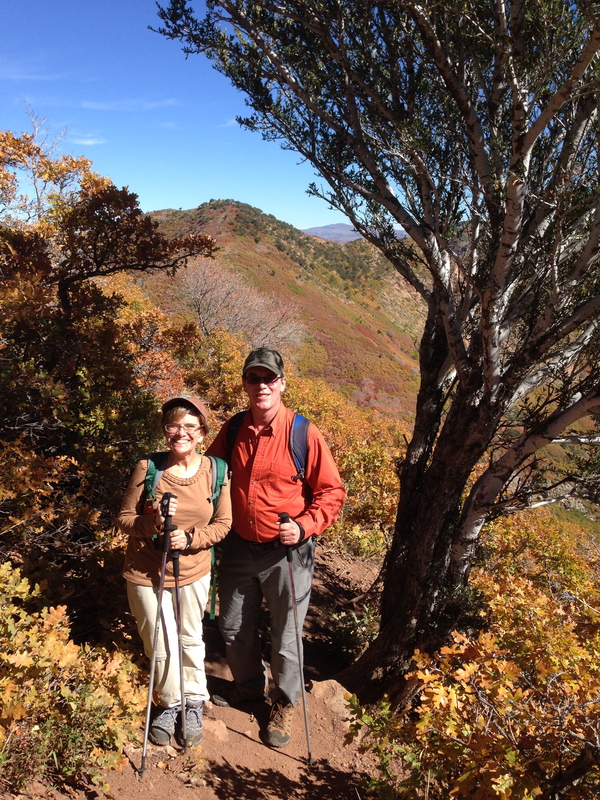 One was the Church Fork trail to Grandeur Peak. 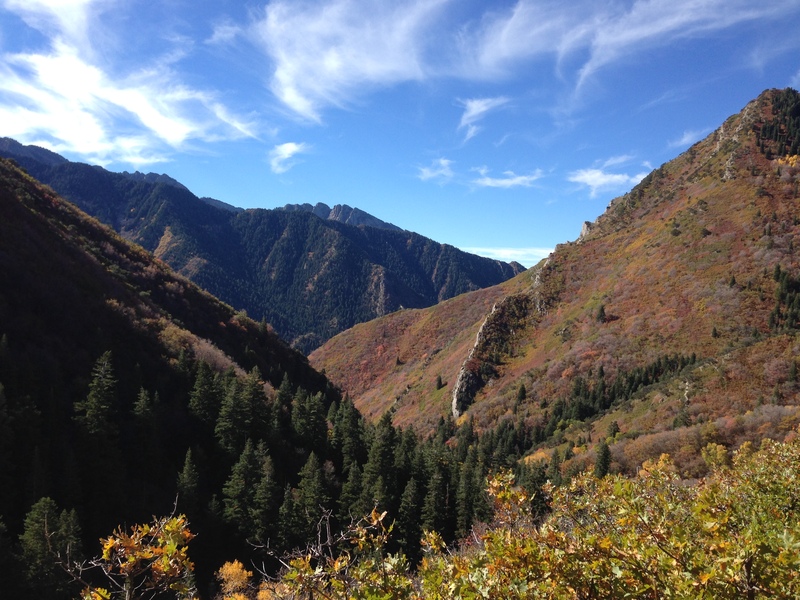 Located in the Watsatch mountains in Mill Creek Canyon, this hike began above 5,000 feet, an elevation that is pretty new to us. The trail begins under a blanket of trees and goes along a stream. Up, up, up! For some reason, we felt the elevation more on this hike than others. I had a tough time at first. All that changed when we peaked above the tree line and saw the incredible view. I took a ton of photos at first, but soon realized that the views would only get better as we used the switchbacks to climb higher and higher. Because this was our first time in the area, we had no idea what our ultimate destination would be. 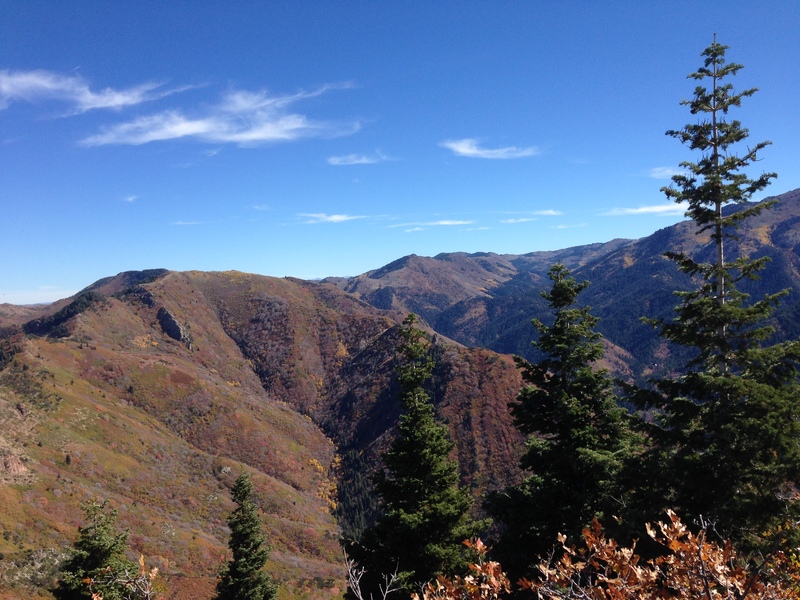 Where was Grandeur Peak? Luckily, I didn’t realize that we would be going so far. I’m not sure I would have thought it possible to complete our goal if I knew we would be hiking so far! See that peak over my shoulder? That is our destination! For those familiar with mountains, this hike may seem routine. For us, it was spectacular. We eventually reached the saddleback with views of Salt Lake City. We continued on and the 360 degree views were amazing. We had ascended about 3.5 miles, to 8299 feet, an elevation gain of over 2,300. On the trip back, I tried to soak in the views. The trees were a beautiful mosaic of greens, reds, yellows, oranges and silvers. The evergreens, combined with the aspens and maples, made the mountains look prettier than any painting. We got to the car and finished up just in time to go to the airport for our trip home. The opportunity to hike in Utah was a nice change from Maryland. 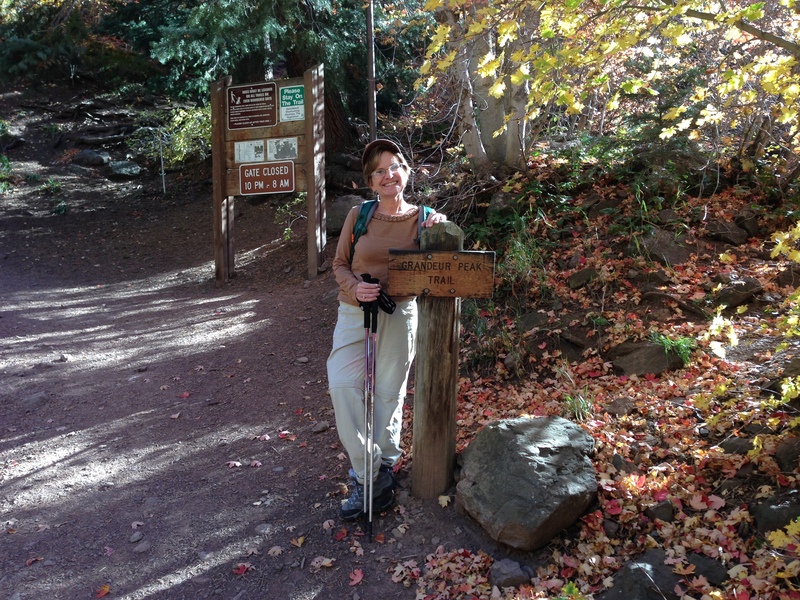 We’ve had some great hikes so far this year! 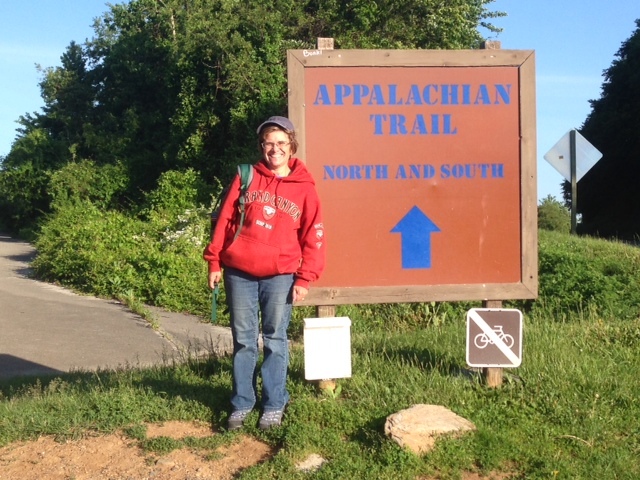 Our weekend of camping was topped off with a short (5-6 miles round trip) jaunt on the Appalachian Trail. As a new hiker, it felt a bit like we had hit the big leagues! 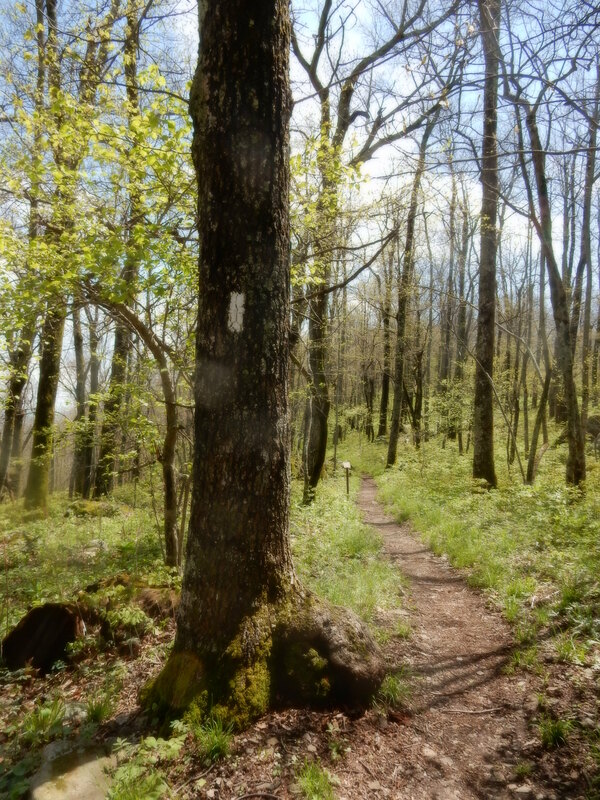 We started the trail at around 8:30 am, near a bridge that connects the trail to Greenbrier State Park. 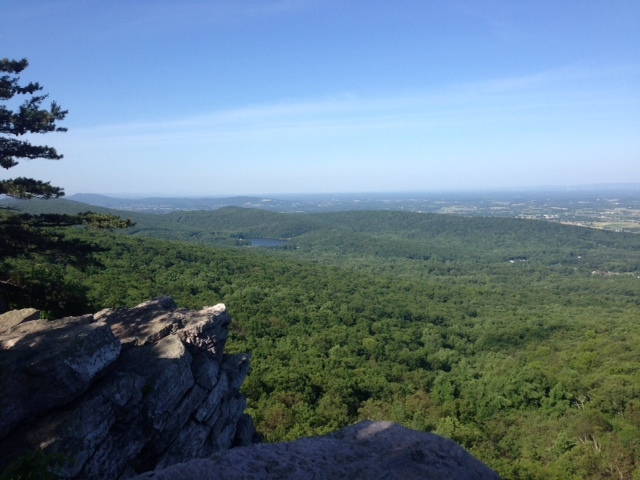 From there, we went north and east, towards Annapolis Rocks. The trail hugs the freeway for a few yards before climbing into the woods. The first mile or so of the hike was pretty much uphill, with some areas very steep. It wasn’t long before it leveled off and became less rocky. Compared to other trails, this one was about twice as wide and very smooth. It took us through a beautiful forest. Most of the hikers that we saw along the way looked pretty serious; they had backpacking equipment full to the brim with tents, sleeping bags, foam mattresses, and other equipment. We passed one designated camping area and saw another one near Annapolis Rocks. They even had a latrine, although I was thinking that the woods looked a bit more inviting than walking into the old, weathered, structure. Annapolis Rocks is about 1/4 a mile down a side trail. It has an amazing panoramic view of the area. We could see the Greenbrier State Park, including the lake. As the morning sun rose, so did the number of hikers. On our way back to the car we saw a lot more people, many with dogs. One thing I was surprised to see was a fox! It scurried across the path a few yards in front of us before slipping into the woods. In all, it was a great hike. I can definitely see myself camping along the trail some day.